Since President Xi Jinping came into office, China has been actively pivoting to the vast expanses of Eurasia, particularly reflected in the strengthening of Beijing’s engagement with its neighbors on its western frontier. One of the most important components of China’s Eurasia pivot is an attempt to build the Silk Road Economic Belt (SREB), with which Beijing intends to bind more than 40 countries in Central and South Asia, the Middle East, and Eastern and Western Europe by means of long-distance transport corridors. 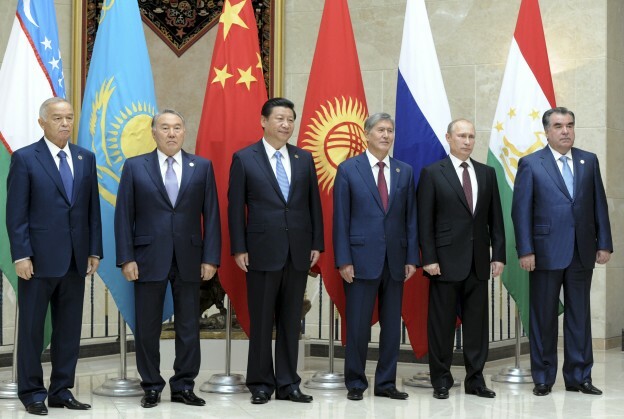 The idea of revitalizing the Silk Road was first announced by Xi on September 7, 2013, during his “Grand Tour of Central Asia.”2 He proposed that the Eurasian countries apply a new model of cooperation and together form the SREB, noting “the area of the new Silk Road, the local regional market, is inhabited by 3 billion people and is unprecedented in its scope and potential.”3 The SREB forms a key component of China’s Eurasian pivot, and Central Asia is assuming new strategic importance in China’s overall foreign policy chessboard. In contrast to Western Europe or East Asia, the Central Asian region is “free from a US-dominated regional order or a pre-existing economic integration mechanism.”4 In Wang’s view, so far, there is no working mechanism coordinating the efforts of major powers, no generally accepted rules of competition and cooperation in the region, and the spheres of influence of major powers in the traditional sense constantly intersect with each other and tend to change. Central Asia occupies a special place within the SREB and China’s Eurasia pivot in general. It acts as a gateway either to the Middle East or to Europe. The collapse of the Soviet Union and the sudden emergence of newly independent states in Central Asia located in close proximity to China presented the Chinese leadership with a completely new and fluid geopolitical scenario on its western border. These events led to a geopolitical vacuum and turned this region into a hotbed of competition among various external forces. Given the outbreak of civil war in bordering Tajikistan and instability in neighboring Afghanistan, the security situation in Central Asia became a constant factor weighing on Chinese policymakers. In the early 1990s, Beijing was not ready for any grand strategy in Central Asia. Basically, it distanced itself from the “internal problems” of Central Asia and focused on priority issues, such as the establishment of diplomatic ties, the settlement of complex issues inherited from the Sino-Soviet period, and the development of common approaches to the problem of Uighur separatism. Having lost some interest in Central Asia during the 1990s, China resumed its activity after the year 2000 through the “Western Development” program, which focused on the Xinjiang Uighur Autonomous Region (XUAR) and other western provinces. After 9/11, Central Asia’s importance increased significantly as a result of more explicit competition among great powers for influence in this region. Moreover, in order to meet a growing need for raw materials, Beijing saw it as an important national interest to guarantee access to Central Asia’s raw materials, particularly oil and gas, and potentially use its transit capabilities. In this regard, China has mainly focused on strengthening the SCO and the development of bilateral relations in the region, primarily in the economic sphere. In the context of sustained growth of the Chinese economy, Beijing implemented some priority infrastructure projects and at the same time supported the ruling political regimes in the region. These efforts laid the groundwork of the Chinese-Central Asian intergovernmental cooperation at the beginning of the 21st century. During the last decade, Chinese economic penetration into Central Asia has increased dramatically, as it skillfully deploys its massive economic resources and strengthens its reputation as a positive economic and political partner in the minds of local elites. The region is becoming increasingly dependent on China–the largest trading partner of Kazakhstan and Turkmenistan and the second largest partner of Uzbekistan, Kyrgyzstan and Tajikistan. Beijing’s investments in the oil and gas industry of Kazakhstan and Turkmenistan have been extremely useful for them, diversifying markets and providing regular sources of income, especially given the recent global downward trend in oil prices and their landlocked position. There are pipelines from Kazakhstan and Turkmenistan to China, and, in the near future, the Kazakh and Turkmen governments are going to put into operation additional pipelines, which pass through Tajikistan and Kyrgyzstan and finally end in China. That would allow the Tajik and Kyrgyz governments to receive substantial revenue from the transit of energy resources. Since energy security primarily drives the “Marching Westwards” strategy, China regards the Central Asian states as reliable partners and suppliers of natural resources, especially taking into account the risks associated with energy imports from the Middle East and Africa across the Strait of Hormuz and the Strait of Malacca (both are narrow sea lanes that the US Navy is capable of controlling at short notice). Also considering the region’s transit opportunities as an alternative route for Chinese exports to the markets of Europe, these circumstances create a win-win situation for both sides. The rapid increase of China’s influence in Central Asia is expressed in its attempts to tie the region to China’s own development, primarily via financing regional infrastructure construction, expanding Chinese participation in the development of natural resources, and using the SCO potential and finally the SREB. These economic diplomacy efforts are becoming a hallmark of China’s foreign policy in Central Asia, and hence one of the key aspects of China’s Eurasia pivot. According to policymakers’ plans, along with Central Asia, the capital of Xinjiang Urumqi stands as a centerpiece of the “Marching Westwards” as well as a transportation hub that connects China, Central Asia, West Asia, and Europe. The government hopes to prevent destabilization and provide a safe environment along the entire border of XUAR. Xinjiang is China’s core area on the SREB since the current and future transport corridors pass through Urumqi. Figure 2: China’s Eurasian Corridors passing through Xinjiang. By tying the Eurasian space with these transcontinental corridors, the Chinese leadership gradually carries out practical steps to make the SREB and its Maritime counterpart a reality. Most notably, on November 9, 2014, President Xi Jinping said, “China would put $40 billion into a special ‘Silk Road fund’ to drive investment in infrastructure, and speed industrial and financial cooperation in Central and South Asia.”12 What is remarkable is that Xi’s statement on the allocation of USD 40 billion for infrastructure followed by just a couple of weeks the launch of the “Asian Infrastructure Investment Bank (AIIB),” initiated and led by China.13 The authorized fund consists of USD 50 billion, later to rise to up to USD 100 billion. Besides China, the bank comprises 20 Asian countries, including Kazakhstan and Uzbekistan. It is assumed to be a counterweight to the World Bank and the Asian Development Bank—two financial institutions that, according to Beijing, are strongly dominated by the United States and Japan. Moscow’s geopolitical project, however, encounters China, which also wants to extend its influence in the region through economic means. Given the recent advancement of the Silk Road Economic Belt, the question arises how will the SREB be able to coexist with the EEU. Some Russian and Chinese experts argue that China’s Silk Road would not undermine the EEU, since they were originally two separate international institutions for different purposes. The EEU implies a single economic space, which would act as a catalyst for the economies of the participants while the Silk Road would be solely a transport and logistics system at the continental level. The Central Asian states themselves are now hedging between Beijing and Moscow. The unpredictable behavior of Moscow in connection with the events in Ukraine has aroused increasing concern among their leaders, who, therefore, have started to intensify their partnerships with China. The oil and gas pipelines built by China helped Kazakhstan and Turkmenistan to redirect their energy routes away from Russia and reduce their dependence. The Uzbek political elites constantly express concerns about the Russian political projects and in 2012 suspended membership in the Kremlin-led Collective Security Treaty Organization (CSTO).17 Arguably, most former Soviet bloc countries are not very much interested in wider promotion of the EEU. In this regard, the SREB appears to be more advantageous due to its scale and economic potential. The SREB might have strong spillover and trade creation effects, which allow Central Asia countries to enter into new markets as the SREB links the east, west, north, and south of the entire Eurasian continent. Washington proposed its own strategy in 2011 when Secretary of State Hillary Clinton unveiled the New Silk Road as one of the main factors of US assistance to the region after the withdrawal of troops from Afghanistan in 2014, aimed at attracting international investment in improving regional trade between South and Central Asia.20 This initiative assumes that the residual military activities by ISAF (the NATO-led security mission in Afghanistan) will not be effective until Kabul is again an economically viable state through the development of trade and transit routes. Two aspects characterize the essence of this project: 1) connect Central and South Asia (Pakistan and India) by highways via Afghanistan; and 2) create a free trade zone between Central and South Asia. The problem with this initiative lies in Afghanistan itself. The notion of operating roads, railway tracks, and power networks connecting Central Asia with Afghanistan and supplying fuel for the economic growth of the entire subcontinent, seriously underestimates the legacy left after the conflict—security threats, drug trafficking and governance problems in the country and the region as a whole, and complex political relations between India and Pakistan. There are other weak points in the strategy of the “New Silk Road.” Iran, one of the most important trading partners of Afghanistan and a pillar of the ancient Silk Road, is excluded from the vision. 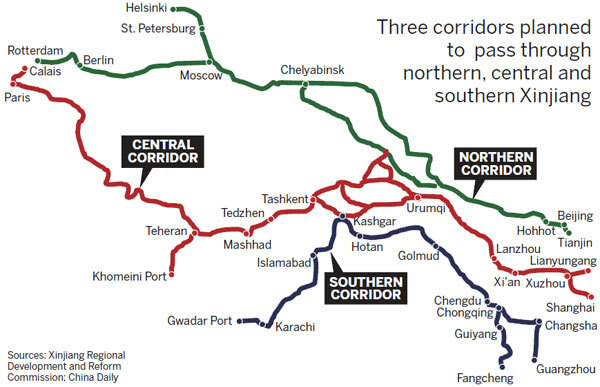 However, this transit corridor could provide a viable alternative to riskier routes through Afghanistan and Pakistan. Over the past few decades, the great powers have attempted to build their own bridgeheads to form a new geopolitical architecture on the Eurasian continent. The United States, China, the EU, and Russia all have sought to establish their dominance in this crucial “World-Island.” However, it seems that China has gradually taken a lead in the Eurasian race. Beijing is constantly consolidating its position in the major geopolitical nodes of Eurasia as a result of is rapidly expanding economic presence. In contrast, the EU and US governments are constrained by the economic resources at their disposal, while Russia is suffering from the economic sanctions adopted by the West and seeing its economic strength significantly weakened. Beijing’s Eurasia pivot will continue to be shaped by both internal and external factors, including satisfying increasing energy demands against the backdrop of instability in the Middle East and North Africa (main energy suppliers of China), as well as finding additional export outlets for Chinese products. Equally important for China is providing “balanced” development for its western provinces and counteracting separatist and extremist groups in Xinjiang, especially given the possible emergence of “instability” hotbeds in conjunction with the uncertainty of the situation in Afghanistan after 2014. In connection with the recent establishment of the AIIB and the Silk Road Fund, the scale of China’s “silk roads” projects suggests that China, as before, would focus on economic cooperation with Central Asian countries, Russia, Iran, the Transcaucasia republics, Turkey, and Pakistan, i.e. with the states that have an important geostrategic position in Eurasia. At the same time, Central Asia would remain the main region of China’s regional efforts in implementing its “Marching Westwards” strategy. This region is a rich storehouse of natural resources and an important transport route for Chinese exports to the west. China’s economic influence in Central Asia inevitably implies a geopolitical challenge to Russia’s position in the region, as Moscow promotes its own Eurasian Economic Union. In these circumstances, Russia is likely to proceed from a “control-cooperation” strategy, which can serve as a basis for interaction between Moscow and Beijing not only in Central Asia but also in Eurasia as a whole.22 On the one hand, Russia would keep a close watch on China: the Kremlin would “delicately” try to set the limits of the Chinese presence in the region in order to avoid a direct confrontation. This does not mean that China will become a geopolitical rival of Russia. On the contrary, China is its important strategic partner. Against the background of the Ukrainian crisis and subsequent deterioration of relations between Russia and the West, Beijing’s support is essential for Moscow. On the other hand, there are plenty of other areas to strengthen joint efforts between these two countries, such as transnational threats (separatism, extremism, terrorism, and drug trafficking) that are especially relevant for Central Asia and the Middle East. Perhaps there is a need to develop a set of additional measures to ensure the security of the region within the SCO framework in the case of instability in Central Asia and the aggravation of the situation in Afghanistan. China itself is not going to interfere directly and would welcome other actors (Russia, the United States) to maintain security in the region. China would shape its regional policy with regard to Sino-Russian relations of strategic cooperation and interest, and in accordance with the current dynamics in Central Asia. China’s geopolitical influence and its global aspirations reinforced by the growing opportunities in Eurasia would naturally increase. At the same time, Beijing would give preference to long-term processes. It may use the SCO as a tool to promote its economic interests in the region, but it will refrain from lobbying for “free trade” projects within the SCO. Ultimately, Beijing would be reluctant to see itself as an integration engine in the former Soviet space or transform the SCO into a new integration project. The main tool of Beijing’s Eurasia Pivot is an array of transport and logistics corridors to bind Central, West, South, and Southeast Asia into a unified transport network. The leadership believes that its management of the vast transcontinental corridors would play a decisive role in the re-configuration of forces in Eurasia. The AIIB coupled with the Silk Road Fund may become the first steps of large-scale infrastructure construction in Eurasia. This prospect has been warmly received by the founding members, many of which experience a shortage of capital for infrastructure projects. For instance, Kazakhstan and Turkmenistan have relatively stable economic growth due to the export of raw materials but lack modern infrastructure. Therefore, there is an assumption that Central Asian countries would become some of the first beneficiaries. In particular, the AIIB may fund the construction of the railway “China-Kyrgyzstan-Uzbekistan” with potential access to Turkmenistan and the Middle East. As mentioned earlier, Beijing intends to open new links towards Central Asia and to link Kyrgyzstan, hydrocarbon-rich Uzbekistan, Turkmenistan, Iran, Iraq, and Syria with Europe via a unified railway network. Nevertheless, political power in some countries of Central Asia and the Middle East is not sufficiently stable. In addition, these regions struggle with poverty and a wide range of ethnic and religious conflicts. Presently the Syrian and Iraqi governments are waging fierce battles with numerous armed groups. Given the extremely difficult political and military situation, the prospects of building the railway through these states currently seem remote. If Beijing decided to be part of this complex picture, it would be very difficult to withdraw from these areas. If it chose to embark on “constructive interference,” there should be a prearranged plan to deal with possible issues and to take into account complex relations between states. The Middle East is characterized by competition between regional leaders, such as Iran, Saudi Arabia, Turkey, Egypt, and Israel. In South Asia, there are still India-Pakistan tensions. No matter what position Beijing took on a particular issue, there would always be a dissatisfied party, leaving it walking a thin line between the interests of different states. However, the situation today in Central Asia gives it a good opportunity to solidify its presence in the region and consequently its “Marching Westwards” strategy in other key nodes of Eurasia. The Central Asian vector of China’s Eurasia pivot is the biggest target of its effort at regional integration. At present, China has a huge influence on the geopolitical balance of power there, wherein it does not use traditional “force” projection peculiar to the great powers. China’s economic might accompanied by “unconditional” investment packages will give Beijing the status of a key player in the region. The overall scale of the “Silk roads” projects suggests that Beijing’s economic policies are gradually acquiring a geopolitical dimension, both at the regional and the global level. At the same time, Chinese officials have repeatedly insisted that its Eurasian strategy allows for the coexistence of the Russian Eurasian Economic Union and the American “New Silk Road” initiative.24 Despite all the talk about global interdependence and a win-win outcome for everyone, however, Chinese policymakers might continue to look at the world through the prism of geopolitical competition with the United States, as American policymakers do towards China. So far, China continues to facilitate comprehensive economic cooperation with an emphasis on transport links. As already noted, China’s Eurasia pivot will for the moment not involve the creation of FTAs or any other integration structures. In this respect, China is increasingly looking to the Asia-Pacific region with the FTA of the Asia-Pacific (FTAAP) initiative pushed forward by Xi Jinping at the recent APEC summit.25 Some experts predict that in the long-term, China will incorporate the SREB and the Maritime Silk Road into the FTAAP.26 Due to the emergence of new internal and external threats in Eurasia, some China observers are inclined to believe that Beijing’s presence in the continent would not be solely for economic purposes. Given the coexistence of several great powers in Eurasia, the role China plays would inevitably have geopolitical implications towards the other players in this region. As Beijing’s stakes are rising in Eurasia, it would probably be more straightforward and assertive to secure its economic interests. However, Beijing would largely remain restrained, as it currently has neither the resources nor the political will to march westwards as a hegemon. The future Eurasian continent might see a complex structure of regional institutions and a balance of power, both of which will bind China. For China, the most urgent question is what kind of regional order it wants to establish through its Eurasia pivot and how. 1. 王缉思 (Wang Jisi), “西进, 中国地缘战略的再平衡 [Marching West, China’s Geo-strategic Re-balancing],” 环球时报 [Huanqiu Times], October 17, 2012, http://opinion.huanqiu.com/opinion_world/2012-10/3193760.html. 2. Mathieu Boulogne, Xi Jinping’s Grand Tour of Central Asia: Asserting China’s Growing Economic Clout (Washington: The George Washington University, 2013), 2. 3. “Xi proposes a ‘new Silk Road’ with Central Asia,” China Daily, September 8, 2013. 4. “Marching West: Regional Integration in Central Asia,” Huffington Post, January 13, 2014. 5. Famous quote by the People’s Liberation Army General Liu Yazhou in referring to Central Asia, China in Central Asia. 6. “New Eurasia Land Bridge provides rail connection between China and Europe,” Railway PRO, July 15, 2010. 7. “The Chongqing-Xinjiang-Europe International Railway,” China Briefing, February 20, 2012. 8. “Antwerp-Chongqing Direct Rail Freight Link Launched,” Industry Leaders, May 12, 2011. 9. 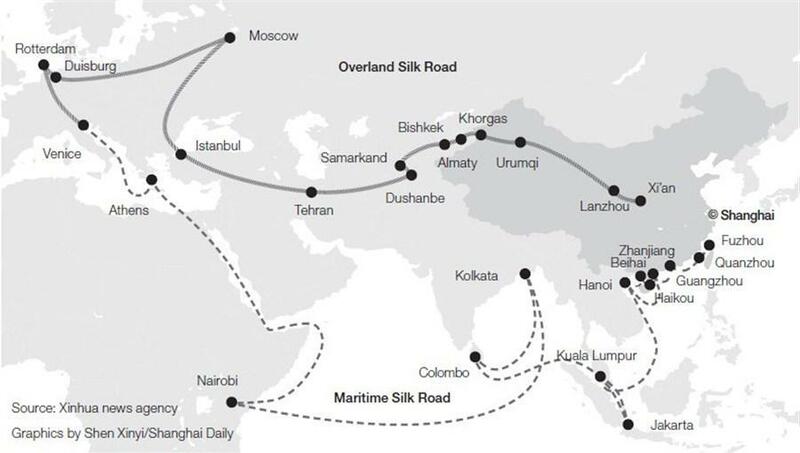 “China’s ‘New Silk Road’ Vision Revealed,” The Diplomat, May 9, 2014. 11. “China Confirms Takeover of Pakistan’s Gwadar Port,” The Times of India, September 4, 2012. 12. “China to create bank to fund ‘New Silk Road’: official media,” Reuters, November 12, 2014. 13. “China, 20 other countries initiate new Asian bank,” Mail Online, October 24, 2014. 14. “The struggle for Central Asia: Russia vs China,” Al Jazeera, March 12, 2014. 15. “Russia, Kazakhstan, Belarus Sign Treaty Creating Huge Economic Bloc,” Time Magazine, May 29, 2014. 16. “Armenia Joins Eurasian Economic Union,” RIA Novosti, October 10, 2014. 17. “Uzbekistan officially withdraws from CSTO,” Armenian Times, December 12, 2012. 18. “Russia signs 30-year deal worth $400bn to deliver gas to China,” The Guardian, May 21, 2014. 19. “Russia and China sign deal on second gas route,” DW.DE News, November 9, 2014. 20. “The New Silk Road?” The Diplomat, November 11, 2011. 22. Олег Голишников: “Центральная Азия на прицеле Китая: последствия для России,” Россия в Глобальной Политике, June 6, 2014. 23. 王缉思 (Wang Jisi), “西进, 中国地缘战略的再平衡 [Marching West, China’s Geo-strategic Re-balancing],” 环球时报 [Huanqiu Times], October 17, http://opinion.huanqiu.com/opinion_world/2012-10/3193760.html. 24. “Китайский “Экономический пояс Великого шелкового пути” не является конкурентом ЕАЭС,” Война и Мир, October 8, 2014. 25. “Apec summit backs Beijing roadmap to vast Asia-Pacific free trade area,” The Guardian, November 11, 2014. 26. “Уживутся ли в Центральной Азии китайский проект Шелкового пути и Евразийский экономический союз?” Eurasianet.org, November 14, 2014.